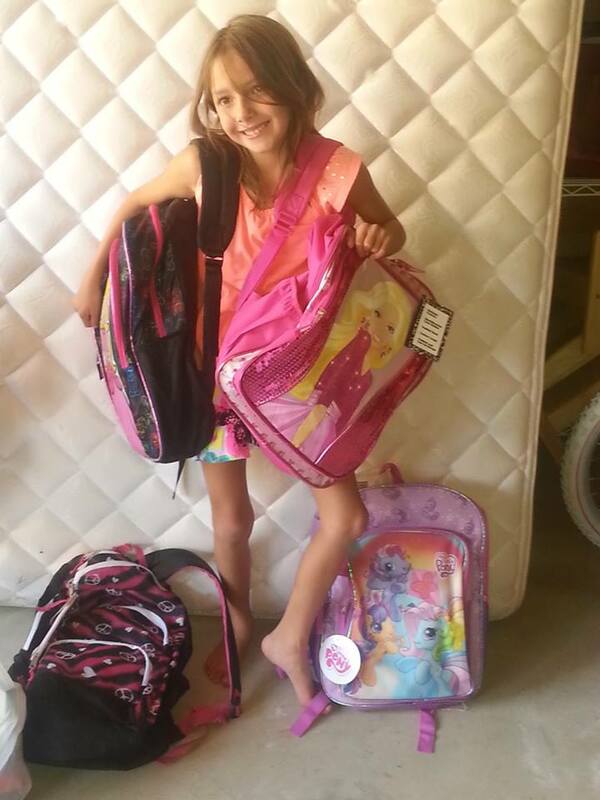 Posted on September 16, 2013 by Michele D.
Zoe collected 8 back-to-school backpacks to donate to foster kids. Last year during my daughter’s first grade year, the Mother of a classmate reached out to the class to ask for help with her chairty, Foster Kids Charity, Inc. She was stuffing backpacks with food, toys and other necessities to donate to foster kids and asked that each member of the class bring certain items. Zoe was assigned small stuffed toys and juice boxes, which she happily shopped for. Once all the goodies arrived at school, the kids formed an assembly line and each had a specific job as part of stuffing the backpacks. The kids had such a great time and learned a wonderful lesson about teamwork and helping kids less fortunate than themselves. This endeavor, and an email from Foster Kids Charity, gave me the idea for a project that Zoe and I could work on over the summer. The charity was helping to gather/create 300 back-to-school backpacks for foster kids, and I volunteered Zoe and I to donate 10. We worked all summer, begging family and friends to donate supplies and we also did a lot of shopping during back to school sales. My hubbie even got into the action when he found inexpensive backpacks at Academy, bringing home 2 for us to stuff. The project took us all summer and last week we were able to donate 7 very full backpacks to the charity and then thanks to a wonderful neighbor, we donated one more for a total of 8 backpacks. Not long after, we received a lovely email from a lady at child protective services telling us the backpacks had already been distributed to foster kids throughout North Texas. Zoe and I were both so happy to be able to help others with something that we take for granted … supplies to get ready for school. And although, we didn’t reach the goal of 10 we set for ourselves, we still loved that we were able to contribute in a meaningful way and will hopefully be able to increase our donation next time around. Happy Holidays, Happy Kosher Treif Cooking and Happy Donating! 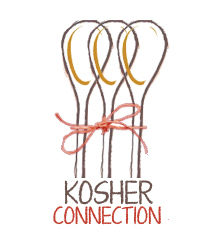 The Kosher Connection, an informal group of creative kosher food bloggers from all around the world, proudly present our monthly kosher recipe challenge. Each month we will present you with recipes on a different theme from all the kosher food bloggers. Follow our recipes on Twitter with #KosherRecipes. This month we got together in the spirit of the holidays to help #SPREADTHEJOY. All of us found our own ways to give back to the community this month and we hope it will inspire you to do the same. Share our link up and articles and comment with your own examples. Together we can bring joy to everyone!